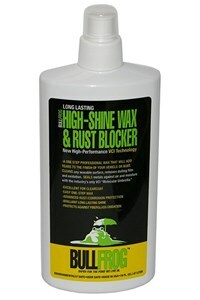 Developed by BullFrog, this premium wax will not only give you an excellent long-lasting shine, but it will block rust too! It cleans any waxable surface, removes dulling film and oxidation then protects the metal from rust using Vapor Corrosion Inhibitor (VCI) technology. VCI technology forms an invisible electrochemical umbrella to seal metal against corrosion causing air and moisture. The VCIs in the wax migrate to seal the adjacent metal. The VCIs also protect fiberglass from oxidation. There’s no effect on the finish, and no chemical build-up ever. In addition, BullFrog High Shine Wax & Rust Blocker stops the ultraviolet (UV) light rays that make colors fade. Excellent for clearcoat. Easy one-step wax. Simply apply the BullFrog Wax using a soft, clean wet cloth in circular motions. Allow to dry to a haze and wipe away to reveal a tough, long-lasting high-gloss shine. 16 oz. bottle. Made in the USA.